With our Modern, Responsive Website & customized Software / Web Application, services, we can help in taking your business to the next level. Our work reflects our experience, innovation and creativity. We deliver affordable software & web solutions, which gives an unique identity to your business, on the Internet. Be it a Informational Portal, E-commerce Website, Corporate Website or a Database Driven Website; We design the websites that are Uniquely designed, Pixel perfect, Responsive, Table-less, Modern, W3C validated, SEO friendly and Affordabletoo. Our Web Application Development services maximizes the effort of designing, developing and deploying Web application tools for business enterprise domains, to create the best website in web industry, aiming user-friendly functionalities for the visitors to get attracted. There are many business enterprises and organizations which have successfully carried out various business operations with the use of Web Portal. Providing amazing products and services in various domains, we also encompass the e-learning sphere. We delivers customised courses for e-learning portals. We train our developer teams well to achieve the exalted status. Hire e-Learning developer teams who provide multiple services like On-line Testing Solution and e-Learning Web Development. We believe in delivering quality products & best services to our clients. We offer professional, affordable website design and development services. Whether you are looking to build your first website or make enhancements to your current site. We can help your business succeed on-line. We can design (or redesign) every aspect of your site. We can also host your site and perform search engine optimization that will help you stay ahead of the Competition. At "the brainhub | TECHNOLOGIES", our approach starts with understanding of your company's goals and objectives for the website. We then translate the results of the brainstorming workshop into a concept strategy for the client and start developing the website, giving priority to the intended audience/market and overall user experience. We have developed customized and unique web solutions starting from simple corporate websites to eCommerce solutions, extensive web-based applications, etc. across various industries. We identify the need, and accordingly design and develop optimal solutions that address the business, marketing and communication objectives. At "the brainhub | TECHNOLOGIES", our approach starts with understanding of your company's goals and objectives for the software & giving top priority to overall user experience. Strong Programming skills are the defining USP of "the brainhub | TECHNOLOGIES" (DM BrainHub InfoTech Private Limited). Typical projects involve advanced n-tier architecture, which integrate with backend legacy systems and databases. A team of application architects and graphic designers excel in creating lightweight interface pages, creative flash demos, intuitive navigation and user-friendly forms and screen layouts. The Quality Control team ensures that all development is bug-free and adheres to the specifications. 'Billing Manager' (A solution to the Institute's need), 'eZEE POS' (A Point of Sale application that targets Retail Management functionality), 'eZEE Workshop' (An ERP package to take care of all the needs of a Workshop), 'eZEE Billing' (A billing & inventory related application to serve the need of any Industry) and packaged pre-configured Enterprise templates. "the brainhub | TECHNOLOGIES" has been phenomenal as an web and software application development services company in India. It provides its clients - innovative, practical solutions. For over 8 years, "the brainhub | TECHNOLOGIES" has been phenomenal as an web and mobile application development services company in India. With its proven track record in various domains, it provides its clients - innovative, practical solutions. The teams of web and mobile apps developer with us follow industry standards for simple to complex, high quality application development services. Benefits of Custom Software Development at "the brainhub | TECHNOLOGIES"
It is through our client centric approach that we have a global presence in multiple countries. "the brainhub | TECHNOLOGIES" leaves no stones unturned while providing its clients with viable business applications, keeping their needs and quality in the forefront. 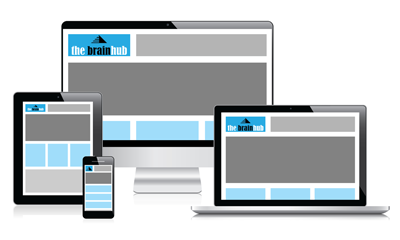 "the brainhub | TECHNOLOGIES" provides professional website design, development and maintenance services. Our skilled web designers and developers accomplish various website projects from brochure sites to multi-functional web portals. "the brainhub" (Karnal, Haryana) has a large pool of resources and the required business and technical expertise to develop websites of any complexity. We provide complete front-end and back-end development based on the latest technologies and industry trends. Functionality is what turns your website from a "shop display" into a powerful business tool. By delivering custom-built solutions "the brainhub" is able to provide the functionality that would completely match your actual business requirements. Modular approach to development allows us to expand the existing or add new functionality easily and cost-effectively when your business requirements change. As a result, you will receive the best return on investment into the current solution and decrease your expenditure on future system extension. Effective communication is vital for the success of any project. We at once establish a two-way knowledge transfer process that would let us, firstly, clearly understand client requirements, and secondly, provide a sound and transparent advice on technology and solution options. From the very beginning of development every project has a project manager involved. The client is able to solve all project related issues through a single person at "the brainhub". We use different communication means: e-mail, phone, instant messengers, Skype, as well as on-site visits, to secure the required level of communication. Our development methodology derives from the best industry practices like Rational Unified ProcessTM (RUP) and Agile methodology. We follow a practical approach to the development process. We know when to apply a "light-weight" approach for a small project to get the optimal cost-time balance. We also know how and are able to expand it for a complex development project. But regardless of the applied process model all projects go through stringent quality verification procedures. A dedicated Quality Assurance team is responsible for quality monitoring and testing at all stages of website development to ensure high quality of the final product. Testing includes various aspects of entire project including GUI testing and HTML standards compliance, functionality-to-requirements conformity, error-free coding, performance and stability testing.